Ice-cream brand Ben & Jerry's has added two new vegan flavors to its growing dairy-free range - which now represents nearly 25 percent of the company's full-time flavors. The new flavors, which are currently only available in the US, are Chocolate Chip Cookie Dough and Chocolate Caramel Cluster. These options take the full non-dairy range to 11 flavors, including Chunky Monkey; Chocolate Fudge Brownie; Coffee Caramel Fudge; Cherry Garcia; Coconut Seven Layer Bar; Caramel Almond Brittle; Cinnamon Buns; and Peanut Butter Half Baked. According to Ben & Jerry's, Chocolate Chip Cookie Dough 'has long been fan-favorite' - so it wanted to create a dairy-free version 'even more people can enjoy'. The flavor is described as a vanilla ice-cream based made from almond milk, with gobs of chocolate chip cookie dough and fudge flakes. The Chocolate Caramel Cluster is a non-dairy exclusive flavor and features a chocolate base with peanuts, fudge chunks, and salted caramel swirls. "Ever since we introduced Non-Dairy in 2016, our fans have been clamoring for more," Ben and Jerry's Flavor Guru, Sarah Fidler, said in a statement. "The biggest challenge this time was creating a chocolate chip cookie dough flavor that stood up to the original. I think we nailed it." The two new flavors are available in grocery stores throughout the US, retailing from $4.48 to $5.99. 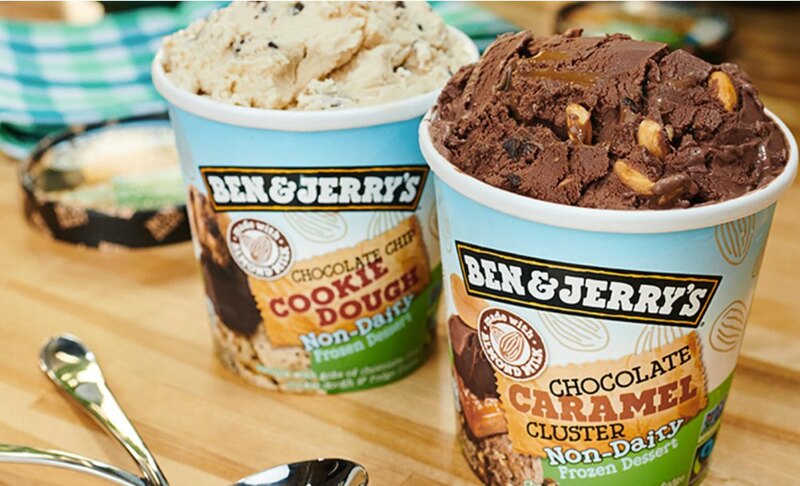 Ben & Jerry's has hinted it will introduce another non-dairy option in early Spring.